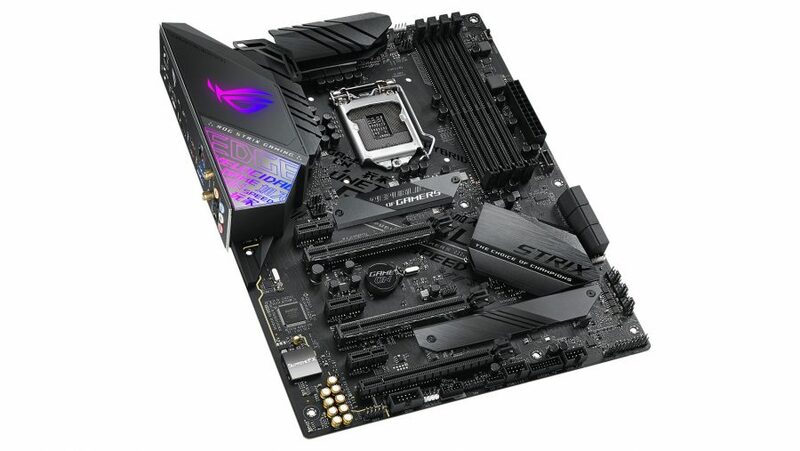 Asus launched a considerable selection of Z390 motherboards this week, with the Asus ROG Strix Z390-E Gaming ranking among them as a solid blend of features and affordability. From its dark and industrial styling, dependable build quality, and excessive functionality, it still has that familiar Republic of Gamers footprint we’ve come to expect from the brand, but slightly more reserved in both looks and price. ROG motherboards are thoroughbreds, and the likes of the ROG Maximus Extreme, Formula, and Code are all prime examples of that high-end focus. 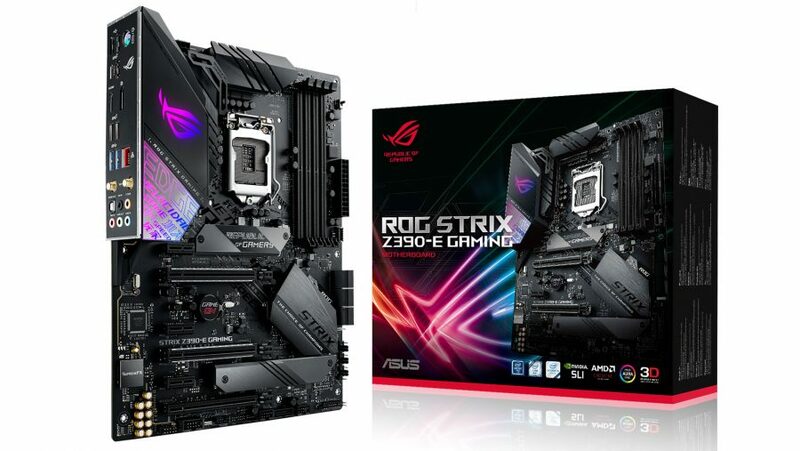 But not all of us are extreme overclockers or hardline loop experts, and while the £228 ROG Strix Z390-E is still a distant cousin to Asus’ genuinely budget-focused Prime motherboards, it’s a slightly more affordable board that still encapsulates that ROG pedigree. Intel’s Z390 chipset is set to replace Z370 as top dog, although brings with it only a few enhancements over the tried and tested formula from the 8th Gen. Now both WiFi support and USB 3.1 Gen 2 support are native to the chipset itself, although, considering the Asus ROG Strix Z370-E Gaming already came with both WiFi and three USB 3.1 Gen 2 ports thanks to supplementary controllers, the new chipset has little real-world impact on the specs list this time around. The same LGA 1151 socket Intel has been rocking for its last few generations of CPUs has made another return, this time retaining backwards compatibility with the last generation of Intel’s processors: the 8th Gen. That means that even if the eight cores of the i9 9900K or i7 9700K aren’t your style, you can still opt for the hexacore or quad-core chips from last year instead. AI overclocking has been a feature rolled out across the board with the latest Asus lineup in an attempt to make your motherboard smarter. Whether you wanted it or not, motherboards are thinking for themselves and now have the ability to rate your CPU’s silicon potential for overclocking prowess and spit out voltages and clockspeeds it thinks to be attainable on your particular chip. It’s useful guidance too, even if only as a starting point to tweak speeds further. Intel’s wireless-AC 9560 controller is now responsible for WiFi connectivity, offering dual band 802.11 a/b/g/n/ac connectivity and MU-MIMO support. LAN is similarly ruled by Intel’s own I219V, with a single LAN port available from the rear I/O. Bluetooth has also been bumped up from v4.2 to v5 with the Strix Z390-E. There are two M.2 sockets on the board, both support PCIe 3.0 x4 with one port also offering SATA connectivity, too. Both drives feature stylised heatsinks with thermal material to draw some of the heat away from your drives during large transfers. Otherwise, you still have six SATA 6Gb/s ports for 2.5” SSDs or chunky HDDs as per the standard for most ATX boards nowadays. As for performance netted from all that, there’s not much to speak of. Until we can get an eight-core chip in the board, performance metrics are solely in the six-core domain, and with Intel’s i7 8700K in the rig, there’s little change in performance over similar Z370 boards launched one year ago. Audio is provided by the same ROG SupremeFX 8-channel codec that made it into the designs from last year. That’s not a bad thing by any means, however, as this tried and tested configuration offers clear and crisp audio with little interference, and as far as motherboard audio goes, is one of the strongest implementations around. With the last-gen ROG Strix Z370-E often hovering around £230, the almost identical price tag makes the latest Z390 a strong proposition. It’s everything from last year’s board with improvements, what’s not to like? Well, hold on. So far this motherboard isn’t actually available. 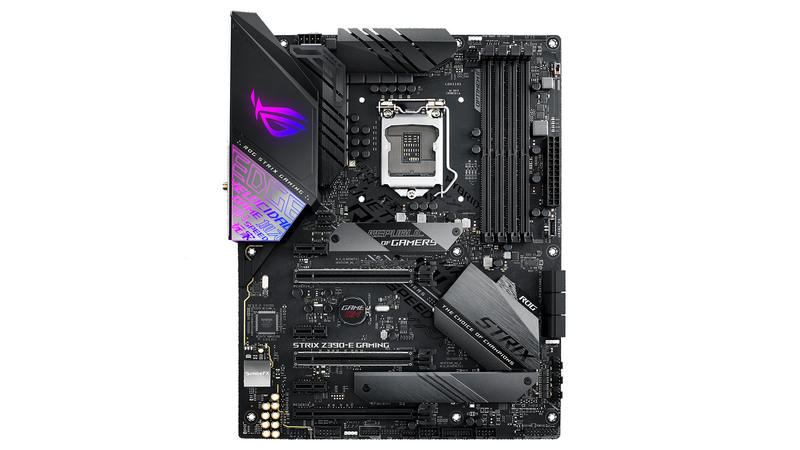 Despite Asus launching the board this monday, stock already seems a little short, or non-existent, with many major retailers still awaiting exact ETAs on some of the Z390 lineup, including the Strix Z390-E. Asus has been cautious to keep some Z370 motherboards lying in wait in case Intel’s 14nm shortage affects its own supply chain for Z390 motherboards. So long as there’s an abundance of stock and prices subsequently stick to the £228 MSRP, or ideally less, the ROG Strix Z390-E Gaming makes for a great fully-fledged motherboard that offers a wide range of extra functionality without stepping over into the extreme. If you want functionality, dependability, and a whole heap of connectivity, the ROG Strix Z390-E Gaming is a worthwhile consideration if your budget isn’t too stringent. The Asus ROG Strix Z390-E Gaming offers a breadth of features useful to the avid gamer and moderate overclocker, yet pulls back just before breaking into seriously niche enthusiast territory. For a board that does it all and a little more, the Strix is a first-rate choice.